The 2007 Pinot Noir triangulates beautiful fruit, beautiful structure and beautiful balance. 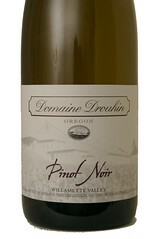 According to Véronique Drouhin-Boss, the joy of Pinot Noir is exceptionally clear in this vintage. In tasting the wine, I remember how strong the vineyards were at harvest, how we picked, block by block, how delighted my father and I were by the fermentations. This is a wine that will age for at least 5-8 years, and almost certainly longer, but I love it now, too. On the palate, the wine shows classic Dundee Hills character, with loads of spice and red fruits. Despite the Willamette Valley designation, the wine consists of nearly 95% estate fruit, and the Drouhin Family Estate's consistent show of mid-palate concentration and silky texture is deliciously evident.